Since 1991, The Gardens of Salonica in Northeast Minneapolis has been serving up classic Greek cuisine that is fresh and flavorful. The chefs make this possible by sourcing their products from local and organic producers. Their cuisine is so good, The Gardens of Salonica are ranked as one of the best Greek restaurants in the area. They are also recipients of the 2013 Talk of the Town Customer Satisfaction Award. It’s funny how life throws you a curve ball every once in awhile. A few years ago when my fiance and I were in search of Greek food after a date in the Twin Cities (we weren’t originally from here), we came acrossed a restaurant that had amazing food that we both remembered to this day. A funny coincidence occurred the other day when my friend invited me to one of her favorite restaurants to catch up. Since I adore any and all Greek food, I immediately said, “yes!” When I walked into The Gardens of Salonica, my first thought was, “omigod, I’ve been here before!” I realized that this was the exact same place my fiance and I had been years before and you better believe that I was excited to be back. We started our dinner with a plate to share, introducing the Spinach Feta Boughasta. Have no clue what this is? I’ll tell you. 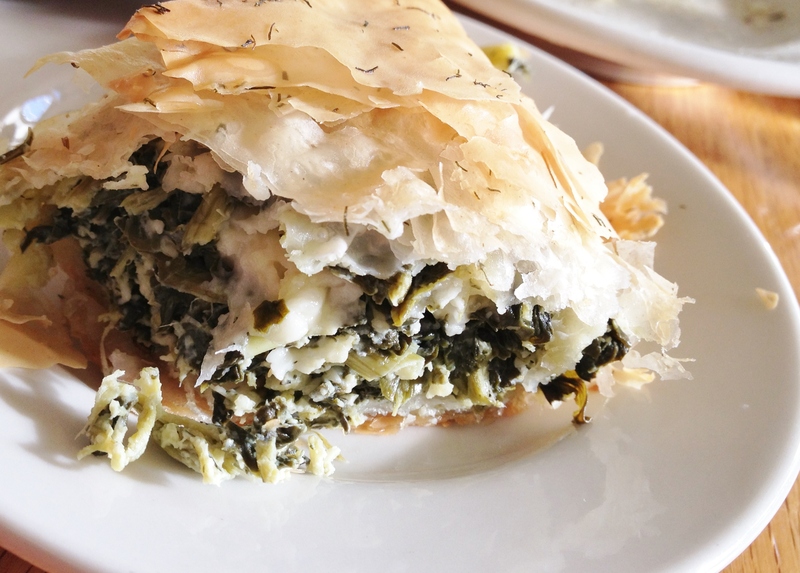 The boughasta is made of delicious, flaky phyllo dough (commonly used in baklava) and stuffed with fresh feta cheese, spinach, scallions and seasonings. When served warm, it is possibly one of the best ways to start a Greek meal. The boughasta has a lot of great, savory flavor and is perfectly light. Personally, I loved it. I thought it had just the right amount of flavor and I enjoyed the melted feta in the middle. For anyone who enjoys these flavor combinations, I definitely would recommend this. Also, a full one is just the right size to share for two people. I went with the house mousakas. What you see below is a party for your tastebuds. The Gardens of Salonica offer both a vegetarian and meat option so all guests can enjoy this one. I went with the regular mousaka, which included meat. 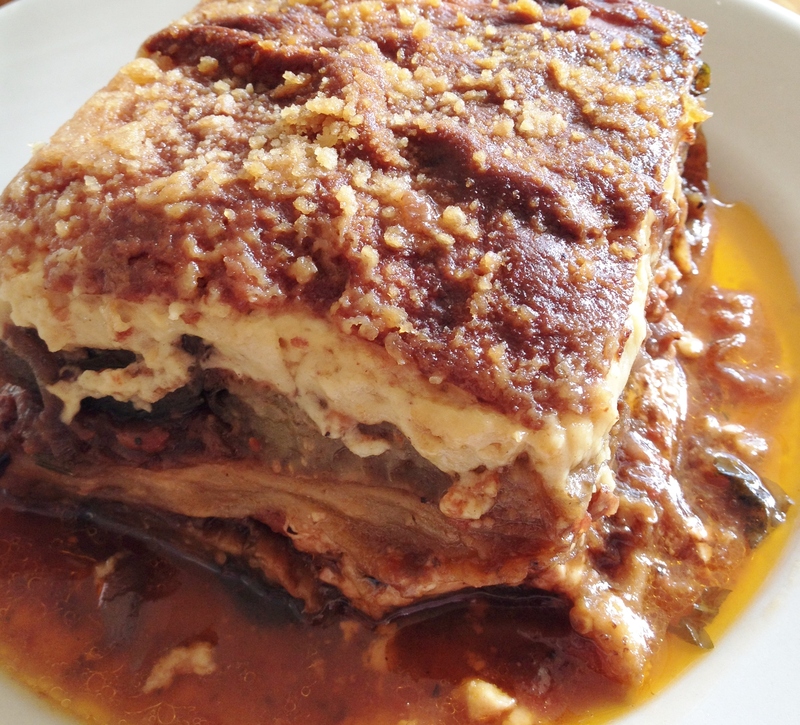 The mousaka is composed of baked layers of oven roasted eggplant and seasoned local, pasture-raised ground beef, topped with bechamel cream sauce of organic milk, Hope butter, Schultz eggs and organic, aromatic spices. Sound good to you? I am certainly a fan of this one. Not only did it taste fresh, but it provided the savory taste that I was looking for. The flavors worked well together. The layers of eggplant and the topping were my favorite parts. The eggplant alone, did an excellent job of absorbing all the spices that were added in. The top. made of the eggs and spices had a great texture that I enjoyed. Sometimes, I can be a little bit of a texture person. Overall, this dish was flavorful and one that I will be ordering again soon. Use the pita bread served with your meal to mop up the saucy base. It’s worth every drop. If you are thinking about visiting anytime in the future, trust me, you won’t be disappointed. The entrees are served with your choice of a house salad or soup of the day and you automatically get a side of pita bread to go with your meal. You really get amazing quality and a lot of food for a very reasonable price. Make sure to put in a reservation beforehand. Dinner time tends to get quite busy, but you should be fine if you are starting your dinner or lunch early.